Censorship is one of the most well-known and detested attributes of China. Many people are already aware that Facebook, Youtube, Google, and the New York Times are blocked and that newspapers and news shows cannot report freely on many sensitive topics. But censorship goes far deeper and is more complex and widespread than that as shown in Trickle-Down Censorship, author JFK Miller’s account of his time working for That’s Shanghai magazine from 2006-2011. Despite the long time period between when he last worked in China and the present, his book is not really outdated because the sad truth is that censorship is not just still present but also much more widespread and harsher than before. But while regular citizens can try and ignore it, journalists and editors have it the worst because it is a constant in their work. Even as an editor at That’s Shanghai, an expat mag that mostly covers food and entertainment, censorship was a major threat to each story Miller worked on or approved. Miller also goes through aspects of modern China through the scope of censorship, which mostly works because of how ubiquitous it is. At the end of it, Miller decides enough is enough and calls time on China, as I did myself. The main point is censorship and there is plenty of aspects to it. It can be arbitrary as there are no firm rules and the censors do not need to explain specifically what is the issue; it can be applied to everything from serious political pieces to photo-essays on pyjamas; it is futile to resist, at best, one can fight to keep a “objectionable” sentence or passage. The worst is that it becomes so prevalent and expected that not only do you get used to it, but you actively apply it to yourself, as Miller did while editing and even assigning stories. “It is frightening just how quickly you acquire the ability,” says Miller. As a reminder, Miller worked for an English-language expat magazine that mostly features food, hotel, and club reviews, not some newspaper or political magazine specializing in hardhitting exposes. And Chinese censorship is not just resilient but adaptable and sophisticated, extending even to the online space where censors utilize software to filter keywords and resulting in the blocking of blogs and social media posts to even text chat messages on WeChat. Coincidentally, this week saw news about China’s government announcing a crackdown, yet again, on unauthorized VPN software, which lots of expats and locals in China use to access banned websites. The only main issue I have with the book is the cover which features an outline of China, that includes Taiwan. It is a somewhat strange and perhaps cowardly decision because it isn’t like the book would be able to be sold in China, given its topic, so one wonders why he had to do that. Experienced expats won’t be surprised at much of the content, but other readers will likely find a lot to inform themselves. Otherwise, Trickle-Down Censorship is a fine account of Chinese censorship, a sad reminder of the power of authoritarian regimes, even in this day and age. As most people know, 2015 started off horribly for Shanghai when a stampede happened during a New Year’s Eve gathering on the Bund. The tragedy took 36 lives and injured 47, though this latter number probably only counts the seriously injured. There were over 100,000 people packed alongside the riverside promenade and street on the Bund hoping to celebrate the New Year when suddenly a stampede broke out along a staircase near a viewing platform (and not outside a club where people inside were throwing out club coupons that looked like US dollars onto the street below). Ironically, the authorities had actually canceled the fireworks to prevent large crowds from gathering as had happened in previous year, but there were other events such as a laser light show and the people still came out in huge numbers. This might be a bad omen for the city and China. Or it might be a sign of the state of the nation and a deadly reminder of what to improve. The tragedy and its aftermath brought to the fore several serious problems in the country. Don’t get me wrong; deadly stampedes have happened elsewhere, including in Germany and in Hong Kong. But these tragedies don’t happen by accident and lessons can always be learnt. First, to be honest, the tragedy was not surprising to many of us who live, study, or have been to the mainland. There were way too many people packed into the area. This is not uncommon in mainland China and neither is inefficient people and site management. I was caught up in the midst of big crowd trying to squeeze into a parking lot at Huangshan last Spring Festival, and many expats and mainlanders have had similar experiences. I would say that there’s often a lackadaisical attitude by authorities in general towards managing crowds whether it be having too little staff at ticket counters or having narrow entrances and exits. For closeup overhead views of the stampede, check this link of photos taken by a photographer on the site. The police admitted they underestimated the crowds because they didn’t expect so many to come out since the fireworks had been cancelled. Yet there have also been reports that many people did not know about the cancellation, which would indicate inefficiency from the authorities. The irony of the situation would be bemusing if it wasn’t so tragic. There were turbulent scenes at hospitals as relatives had to jostle with police and hospital staff due to desperation and frustration. Again, this is not uncommon on the mainland and it shows the authorities need to put in more effort to providing aid and information to the public. Unfortunately the opposite might be happening. Censorship and control are taking place. People who criticized the authorities online have been interrogated by the police. Relatives of the dead have also been followed and hindered from talking to the media. They have also said they have been refused permission to take back the bodies of their dead relatives. Local Chinese media have been ordered to restrict their criticism and follow rules such as using official headlines. This article describes the various ways how the authorities are monitoring, controlling and even intimidating relatives. The authorities are also responding to the tragedy in a heavyhanded way by cancelling other public events such as . While growing crowds are a concern for many events and places in the mainland during holidays, cancelling events is not the best option. Limiting the number of visitors, improving crowd management and increasing the number of security and staff at public places would be better options. People also need to look at their own behavior and realize there’s a lot that needs to be improved. On the mainland, there’s a lot of boorish and inconsiderate behavior in public, especially in crowded places like subways and lines. Pushing, shoving and standing in each other’s ways are common enough. For me, the subway in Beijing is a particularly sore point. Yet, I’m not sure that things will progress much. The authorities may have been open to admit some fault, but their treatment of the relatives and interrogation of online critics shows that even such a massive tragedy will not bring on full accountability and transparency. Also, there is the issue of whether the authorities will learn from this and improve their crowd control and management skills or just resort to blanket bans of events, as some are already doing. I hope I could be proven wrong though. Earlier this year, I went to Hong Kong and Shanghai, and even though I’ve been to both these cities several times, I took a lot of photos, in particular Shanghai. Both places are world-class cities, with a strong commercial and financial industry, and both consequently also boast very impressive skylines as if to drive home their status. 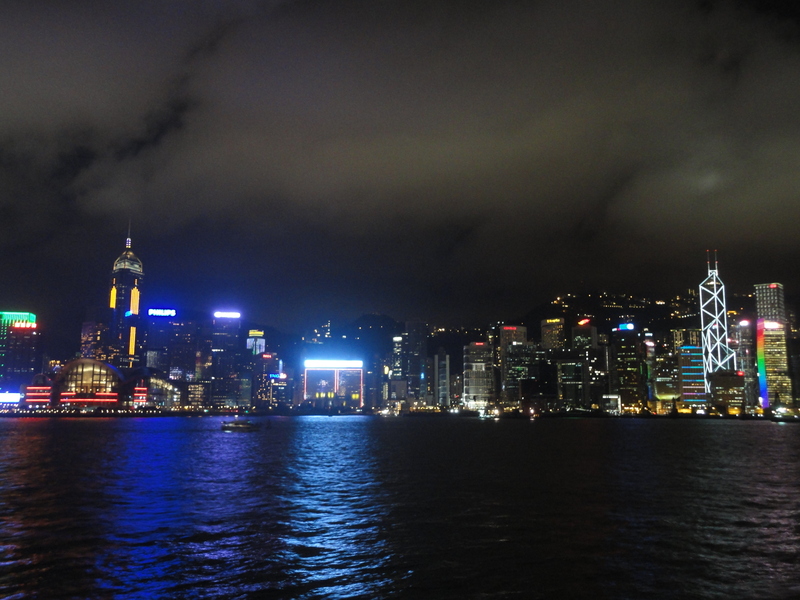 These skylines are also great to view, especially at night. Hong Kong’s business skyscrapers (as opposed to their residential skyscrapers) are concentrated on Hong Kong Island’s Central and Wan Chai districts, while Shanghai’s are in Pudong, opposite the Bund. I can’t say which one is more attractive, but here’re some photos for you to judge yourself. These skyscrapers are directly opposite the Bund on the other side of the Huanpu River, so it’s a good way to see two great sets of architecture at once. 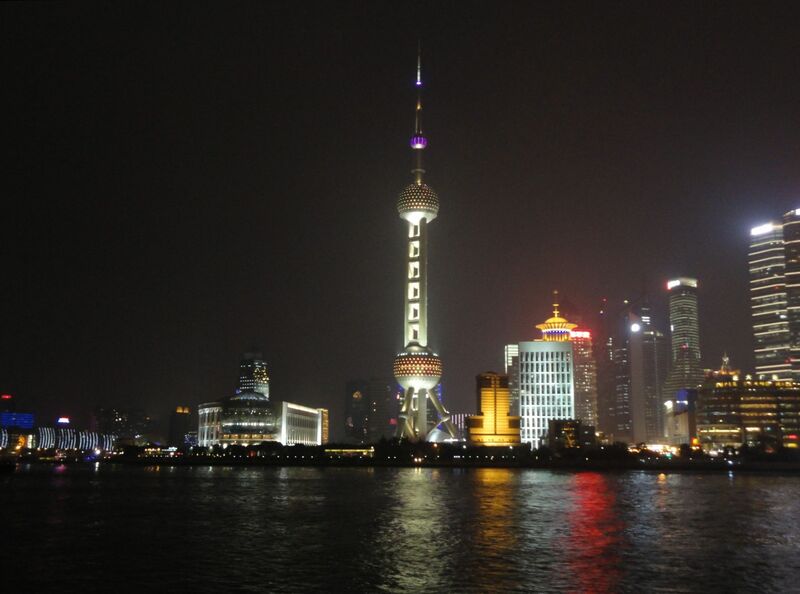 The colorful, circular, UFO-pod, Oriental Pearl Tower on the left has been a symbol of Shanghai since the mid-1990s, but my favorite towers are actually the bottle-opener-topped World Financial Center and the Jin Mao Tower. 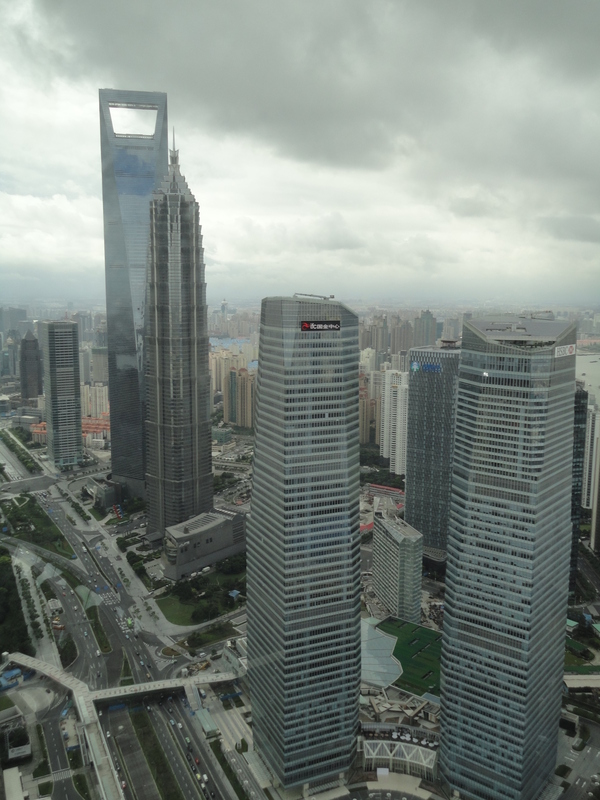 A new tower, the Shanghai Tower, is currently being constructed alongside the World Financial Tower, which will be even taller than these three. 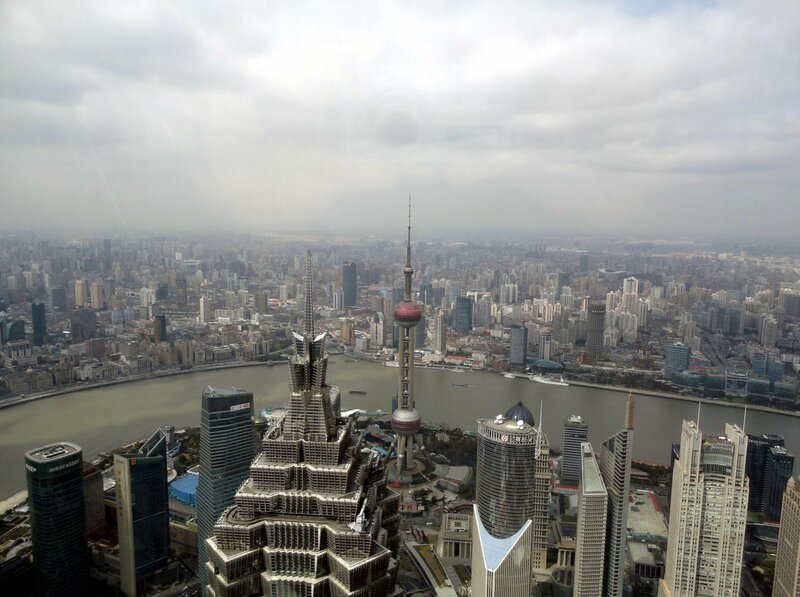 This was taken from the observation deck in the World Financial Center looking down on the top of the Jin Mao tower, which gives you an idea of how tall the WFC is. 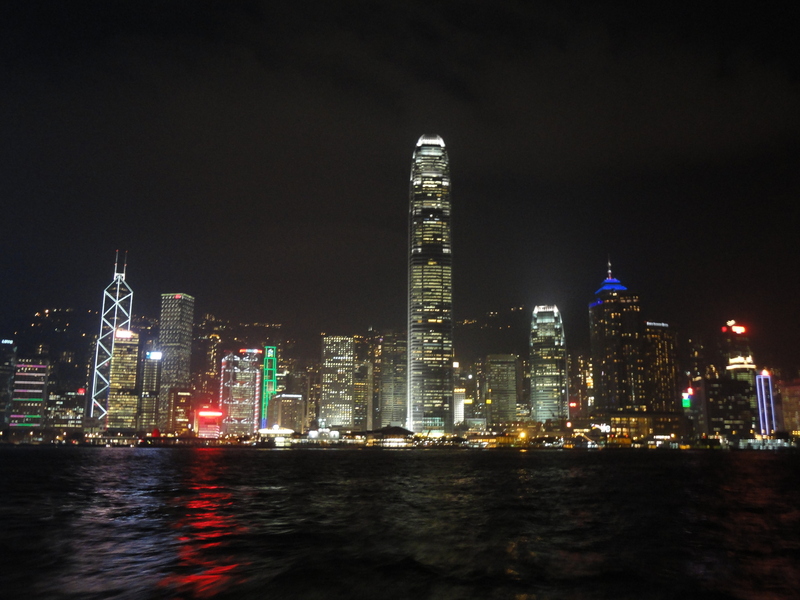 You can view these towers from the Kowloon side, with the Tsim Tsa Tsui waterfront being a particularly good spot, or on the ferry coming across to Central or WanChai. 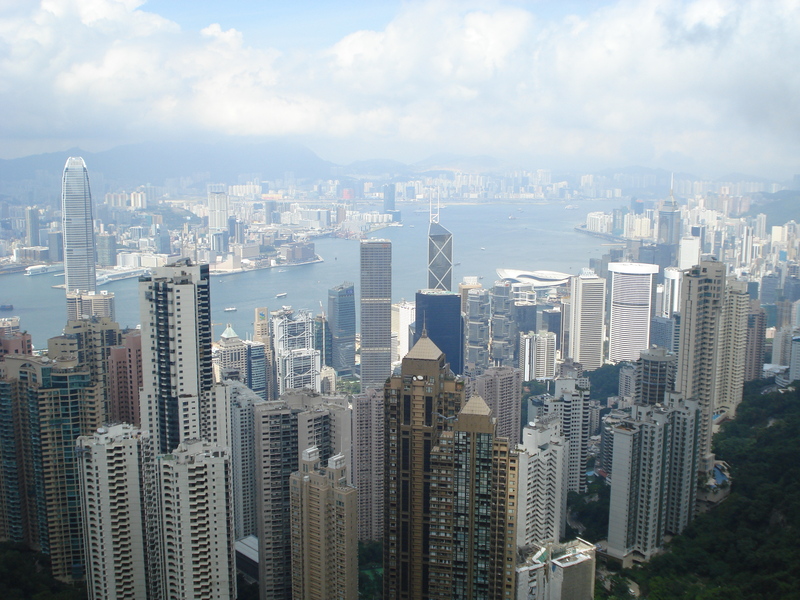 Or you can also view them from on top from the Peak, one of Hong Kong’s most famous places. Even though you’re viewing the towers from behind and from the side, it’s still a fantastic sight. The tallest tower is the rigid, cone-topped International Finance Center (which I now realize has a somewhat phallic resemblance), HK’s 2nd tallest building, but my favorite tower is the Bank of China tower, which is the angular one with the straight triangular lines to the left in the pic below. Hong Kong’s tallest tower is actually on the Kowloon side, in the newly developed West Kowloon area, but it’s not as impressive as these older ones. Home ownership has been something that has perplexed me for a while. Since I was in university, I’ve looked at the astronomic prices of homes (then in Toronto and now in Taipei and Hong Kong) and wondered why more people didn’t rent. I know the supposed benefits of owning your own place- the secure feeling of owning your own home which then forms a big part of your assets, as an investment, and as something you can pass on to your children. Yet costwise it seems sometimes it doesn’t make sense. No matter how good a location or the potential surge in values, there’s no reason why you should buy a home that would cost you several decades to pay off. In America, more people also seem to be embracing renting, a sentiment which I strongly agree with. I’m not saying I wouldn’t want to own a home, but at a reasonable cost. Besides, change is a bigger aspect of our lives than our parents or grandparents, with moves and job changes and long-term travel more common now. This recent development in China was a slight surprise to me, but the reason for it isn’t surprising. Expats are being forced to turn away from Beijing and Shanghai to lesser metropolises like Chengdu and Hangzhou, due to more Chinese returning from overseas. More and more Chinese going abroad to study and picking up Western skills, knowledge and savvy, and many will of course want to return home. As such, it’s not going to be so easy for expats to make it in China, but that doesn’t mean there won’t be a role for them. They, and myself as well, will just have to try harder and be open to new opportunities in other cities. In golf, there’s more good news on Chinese prodigy Guan Tianlang, as he made the cut to move into the final round. Guan made history by being the youngest person to play in a golf major, and he made further history by being the youngest to make the cut. His age- 14. Guan is from Guangzhou and has already played and won tournaments with adult competitors. Good luck to another Chinese succeeding in sport (though golf is not actually a real sport). Here’re a few more interesting links on China and Taiwan from earlier this week and which I posted on my China blog Random China. Chinese tourists are swarming the world and for some, it’s a big concern. The article is subtitled “The good, the bad and the backlash”, which gives a good idea of what it’s about. Not surprisingly it mentions Hong Kong, where some of the worst anti-mainland bias can be found, especially against mainland tourists. 83 million Chinese traveled overseas in 2012, becoming the top spending tourists in the world and overtaking Americans and Germans. This is good because it means more Chinese have the means to travel and are able to spend well. This is a positive development and I just hope the numbers will continue to increase. Of course, there are adverse effects from the big numbers and cultural differences and unfortunately, bad behavior from a significant minority. The article does a good job to examine this last issue with several Chinese quoted saying that many Chinese do not condone rude behavior and are indeed aware and ashamed when fellow countrymen act badly abroad. Dinosaurs were found in Yunnan province recently. Actually, these were fossilized dinosaur embryos that were estimated to be 190 million years old! The fossils might even contain tissue remains which could be extracted for research. That’s pretty amazing to think that organic matter could have survived so long. I was initially surprised when I first saw the headline of this article, but after some thought, not so much. Basically, Taiwanese don’t read much, much less so than people in countries like France, Russia, Japan, and mainland China. This worries the government so much that the ministry of culture has come up with a plan to help local publishers. The Atlantic Monthly article describes the decline in reading and, and mentions this is contrasted by Taiwan’s many bookstores, highlighted by the very well-known Eslite, an elegant local version of Borders (US) or Chapters (Canada). The main conclusions are that Taiwanese mainly buy Western bestsellers or self-help books, reading isn’t very popular, and that the local literary scene is not in good shape. I do have local friends and acquaintances who read, and Western books are indeed popular. I can’t confirm the article’s assertion that nobody reads (the title is definitely a very hyperbolic one). Many people do read newspapers, magazines, and manga (Japanese comics). However, I’d say I don’t find it surprising that locals don’t read much books on average, since I feel that many young people, or even middle-aged people, don’t seem curious about or want to know more about the world. Since most available books are written by non-Taiwanese and about the world, I’d think this doesn’t help to make books very appealing. Couple that with the fact that the local media is not very professional and focuses more on gossip and scandal than hard news, making for a less informed population, and that there’re many forms of entertainment and leisure to distract Taiwanese, and it’s not hard to see that reading, especially serious literature and nonfiction, may be seriously declining. As the writer says, many people in libraries here are either studying or browsing magazines or newspapers, or making out (I can’t say I’ve seen this), while Eslite is popular but it’s mostly a hangout spot (to be honest, I do see many people reading whenever I’m there). The future is going to be bright and dynamic for urban China, says Foreign Policy’s August Cities issue. Cities issue- actually it’s more like the China issue. There’s articles and slideshows galore of Chinese cities. 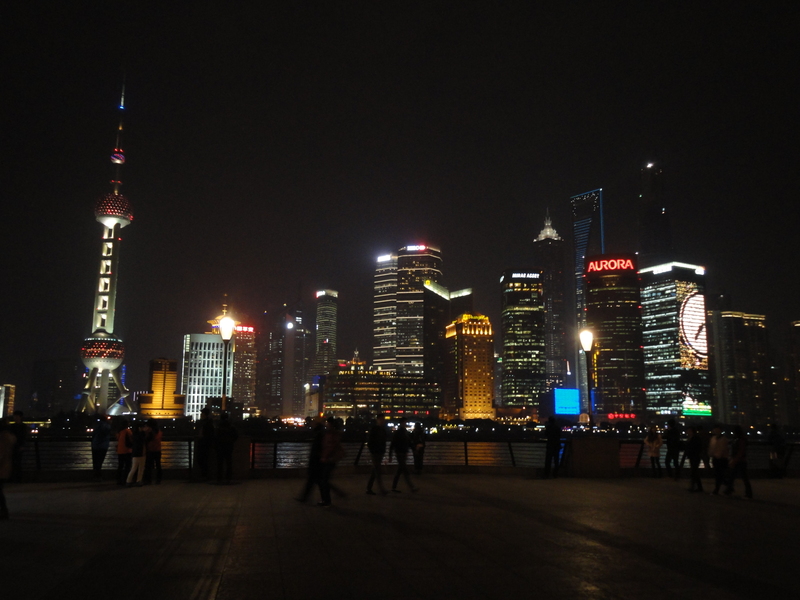 The articles include one apiece on Beijing and Shanghai, one on Guangzhou, Shenyang and Kashgar as cities with unique characters, and even one damning Chinese cities. The last one slams Chinese cities as plain, uniformly ugly, and bad to live in, and it kind of goes against the article on Guangzhou and the 2 other cities. On a negative note, I have to say this collection of articles represents the two extremes of China reporting- deeming China as the next superpower, as the country of the future, the one with the world’s most dynamic cities, – and conversely, blasting China for being crude, ungainly, and dirty. I can’t quite agree with his general criticism. I haven’t spent much time in China but I felt that Beijing and Nanjing and Hangzhou and Shanghai all have their different charms and character. It’s true there’s a tremendous lot of massive, gray, concrete buildings, but then modern Chinese architecture and city planning is slowly progressing. Don’t get me wrong, I think in general the articles are pretty good, so go read the articles because they’re quite interesting and will probably stimulate your brain a bit. To top it off, there’s even an interview with everybody’s favorite Chinese scamp, Ai Weiwei. To be honest I’m not totally sold on this man. I do think he speaks some sense, and his bluntness and directness is good, but then he also seems a bit full of himself and he’s a bit on the hyperbolic side. I can understand that after all he’s gone through, even having his head cracked, why he’s a bit bitter and cynical on his country though. The articles aren’t actually all about China of course, though the China presence is overwhelming. The reason why I wrote the headline and the first sentence is that the magazine lists 75 cities as the most dynamic of 2025, and 29 of them, over 40 percent, are in China. The 29 are led by Shanghai and Beijing, predictably, with Guangzhou, Tianjin, and Nanjing also there. However even provincial cities like Wuxi and Dongguan make the list, as did lowprofile provincial capitals like Hefei (capital of Anhui province) and Jinan (Shandong). Nothing would make me happier if predictions like these came true and Chinese cities would be the most dynamic in the world (as Shanghai is right now), but I still think these kinds of articles are too optimistic and it’s necessary to keep grounded. Shanghai Shenhua’s messiah finally arrived in Shanghai, as the wild scene from Wild East Football shows. Didier Drogba, Ivorian and former Chelsea star, was welcomed by a huge mob of adoring fans at Pudong airport who chanted his name, their club, and some nice words for archrival Beijing Guoan, who Shenhua, coincidentally, would play that night. Drogba was unveiled (check out the big cheer at 1.58 when Drogba says “ni hao” to the crowd) before the game at Shanghai’s Hongkuo stadium (see video highlights here or below: that night, but not as a player), and no doubt, helped inspire Shenhua beat Beijing. I’m not a big Chinese league football fan but I couldn’t help feeling chills at the passion in the airport video, especially at 2.05 and 2.50 (warning: vulgar language).